It's been very busy lately, so I'm going to be using my genealogy time to utilise my new spiffy Findmypast subscription rather than blogging this weekend - I need to relax! However, I had to chip in on the Geneabloggers Open Thread Thursday topic for the week: Ethical Dilemmas. I'm not going to blog about specific ethical dilemmas, as that's something I do regularly in my blog (eg Mervyn Dawson, THAT family heirloom etc.) However, I'm going to list my key considerations when it comes to disclosing information. 1. I firstly always consider those who are living. If it's going to be deeply distressing or humiliating for a living relative, negative about them or adversely affect them, then there's no question I'd keep it on the down-low. 2. I also consider whether social attitudes have changed on the issue at hand. For example, illegitimacy has no social stigma now, so it doesn't trouble me to find out about that or share it. Nobody who hears it is going to think any the worse of my ancestor/relative now. In fact, often it's quite the opposite: people have more admiration for them for having faced adversity, or they enjoy having a connection to a good scandal or a total scoundrel. In answer to the title question, is there a 'right' to do genealogy? I say 'damn straight'! As a totally off-topic addition, today I received a rather exhilarating geneaboost. I have many of my media files on Ancestry, including the marriage certificate of my semi-brick wall great-grandfather, Patrick McDermott, for whom I have never located a living relative aside from my immediate family. Consequently I went temporarily insane with excitement today to discover the following comment added to the file, which has been there unremarked upon for three and a half years: "Found this Certificate of Marriage in with family documents." Can it be? Has someone found a copy of this certificate in a box they are clearing out, and checked on Ancestry to see what they can find out about the people it belonged to? Could this person turn out to be related to Patrick's brother who was alleged to have moved to Australia? Could his/her ancestors have known my ancestors? Will I find out more about Patrick? I shelled out $10 for a pay-per-record Ancestry subscription* just so I could message the comment's author, so I hope I hear back SOON! Love the way you write! 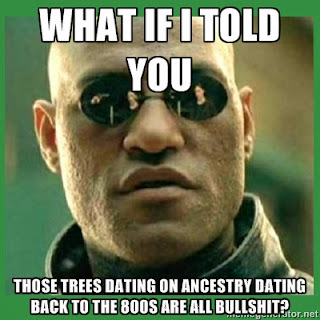 I know how you feel about lack of living descendants. I am only just now beginning to find a few on one of my paternal lines. Good luck!